This species is accepted, and its native range is Ethiopia to S. Africa, Arabian Peninsula to India, N. & Central Australia. Naturalizada en Colombia; Alt. 5 - 990 m.; Amazonia, Islas Caribeñas, Llanura del Caribe, Pacífico, Valle del Magdalena. Annual climber or trailer to 1.5 m.; stems ± spreading-hairy, hispid or lanate. Leaf-blade membranous, broadly ovate- or reniform-cordate in outline, ± scabrid-hairy (especially on nerves beneath) or scabrid-punctate, shallowly sinuate-toothed, 26–160 mm. long, 33–200 mm. broad, unlobed or variously palmately 3–5-lobed; lobes usually broad, shallow and rounded, with the central largest, semicircular, broadly ovate or ovate-oblong, rarely elliptic, usually not or but little narrowed towards the base; petiole spreading hispid-hairy, 27–105 mm. long. Male flowers in 2–4-flowered fascicles; pedicels slender, 3–25 mm. long; receptacle-tube pale green, 3–6 mm. long; lobes linear-lanceolate or filiform, 1–6 mm. long; petals yellow, 5–22 mm. long, 2.5–14 mm. broad, united in lower third. Female flowers on stalks 3–50 mm. or more long; ovary elliptic to elongate-cylindrical, densely adpressed-pubescent to long-lanate, 5–60 mm. long, 2–6 mm. across; receptacle-tube 2.5–5 mm. long; lobes lanceolate or ovate-lanceolate, 1–6 mm. long; petals 4–19 mm. long, 2–12 mm. broad. Male flowers in 2–4-flowered fascicles; pedicels slender, 3–25 mm. long; receptacle-tube pale green, 3–6 mm. long; lobes linear-lanceolate or filiform, 1–6 mm. long; petals yellow, 5–22 mm. long, 2.5–14 mm. broad, united in lower third. Female flowers on stalks 3–50 mm. or more long; ovary elliptic to elongate-cylindrical, densely adpressed-pubescent to long-lanate, 5–60 mm. long, 2–6 mm. across; receptacle-tube 2.5–5 mm. long; lobes lanceolate or ovate-lanceolate, 1–6 mm. long; petals 4–19 mm. long, 2–12 mm. broad. Fruit on a 6–40 mm. or more long stalk, ovoid, bluntly ellipsoid or oblong-ellipsoid, 35–100 mm. long, 20–75 mm. across, in cultivated forms often much larger and sometimes very elongated, variable in colour, sometimes netted, commonly green or striped dark and light green, citron-yellow or orange and with the surface smooth. Seeds compressed, elliptic in outline, 5–8 × 2.5–4 × 1–1.5 mm. A weed of cultivated land and waste places; 0–1220 m.
Female flowers solitary; pedicel stout, 3–50(80) mm. 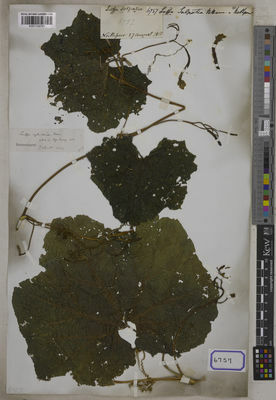 long; ovary (5)11–16(60) × 2–6 mm., various, often oblong, velutinous; perianth similar to that ofmale flowers. Fruit 2·5–10 × 2–7·5 cm., various, pyriform, ellipsoid, oblong, globose or obpyriform, green with lighter green or yellow stripes becoming yellow when ripe, in cultivated forms often much larger and very variable in size, shape, ornamentation and colour; fruit-stalk 1–8 cm. long. Seeds 5–8 × 2·5–4 · 1–1·5 mm., elliptic in outline, in cultivated forms often larger. 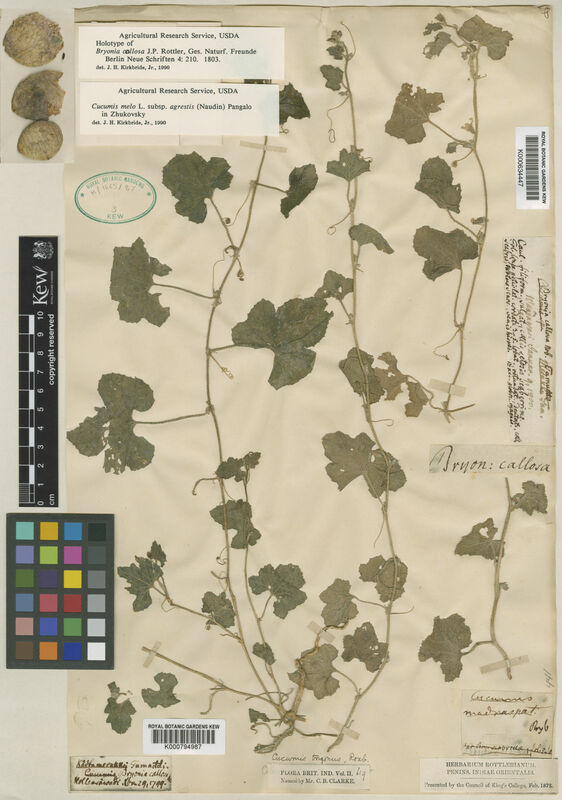 Annual; stems prostrate or scandent, to 2 m., patent-setulose or hirsute. Leaf-lamina 2·5–8·5(16) × 3–11(20) cm., broadly ovate to reniform in outline, shallowly cordate, sinuate-denticulate, more or less setulose becoming punctate above and beneath, unlobed and broadly rounded or variously usually faintly palmately (3)5—lobed, lobes usually broad, shallow and rounded. 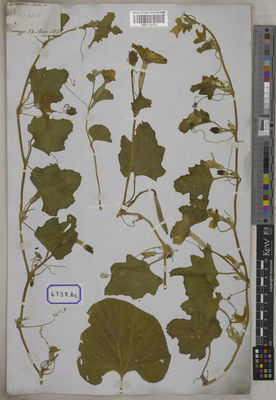 Petiole 1·5–8(10·5) cm. long, patent-setulose. male flowers solitary or 2–5 in small sessile or shortly pedunculate fascicles; pedicels 3·5–4·5(25) mm. long, often densely setulose. Receptacle-tube 3–8 mm. long; lobes 1–3·5(6) mm. long. Petals 3–10(22) mm. long, yellow or pale apricot yellow. Female flowers solitary; pedicel stout, 3–50(80) mm. long; ovary (5)11–16(60) × 2–6 mm., various, often oblong, velutinous; perianth similar to that ofmale flowers. male flowers solitary or 2–5 in small sessile or shortly pedunculate fascicles; pedicels 3·5–4·5(25) mm. long, often densely setulose. Receptacle-tube 3–8 mm. long; lobes 1–3·5(6) mm. long. Petals 3–10(22) mm. long, yellow or pale apricot yellow. Stems prostrate or scandent, to 15 m., finely hairy. Leaf-lamina 6–18 × 6–23 cm., broadly ovate in outline, cordate, dark green, asperulous or scabrid, palmately 5–7-lobed, the lobes triangular to elliptic or narrowly oblong-lanceolate, obscurely sinuate-denticulate to coarsely and deeply sinuate-serrate or rarely lobulate, obtuse to acute, often acuminate, apiculate, the central largest. 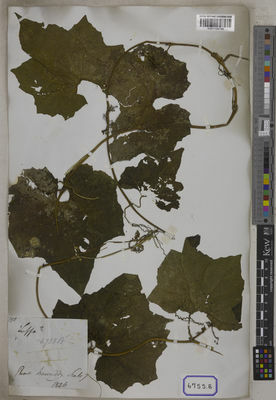 Petiole 1–15 cm. long, finely ascending-pilose, becoming scabrid-strigose. Probracts 3–7 mm. long, oblong-ovate or obovate. male flowers racemose; peduncles 7–32 cm. long, finely hairy; pedicels 3–12 mm. long, finely hairy; bracts adnate to the pedicels, spathulate, glandular, 2–6 mm. long. Receptacle finely hairy; receptacle-tube 3–7 mm. long, obconic below, expanded above, lobes 9–14 mm. long, triangular, acuminate, sometimes glandular. 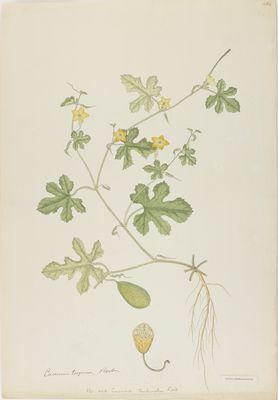 Petals 2–4·5 × 1–3·5 cm., rich yellow. Stamens 5 or rarely 3. Female flowers on 2·5–14·5 cm. peduncles; ovary 20–40 × 2–7 mm., cylindrical, densely puberulous; receptacle-tube 2·5–6 mm. long, lobes 8–16 mm. long, ovate-lanceolate or lanceolate, glandular; corolla as in male flowers. male flowers racemose; peduncles 7–32 cm. long, finely hairy; pedicels 3–12 mm. long, finely hairy; bracts adnate to the pedicels, spathulate, glandular, 2–6 mm. long. Receptacle finely hairy; receptacle-tube 3–7 mm. long, obconic below, expanded above, lobes 9–14 mm. long, triangular, acuminate, sometimes glandular. Petals 2–4·5 × 1–3·5 cm., rich yellow. Stamens 5 or rarely 3. Female flowers on 2·5–14·5 cm. peduncles; ovary 20–40 × 2–7 mm., cylindrical, densely puberulous; receptacle-tube 2·5–6 mm. long, lobes 8–16 mm. long, ovate-lanceolate or lanceolate, glandular; corolla as in male flowers. Fruit 6–25 × 2·5–6 cm. 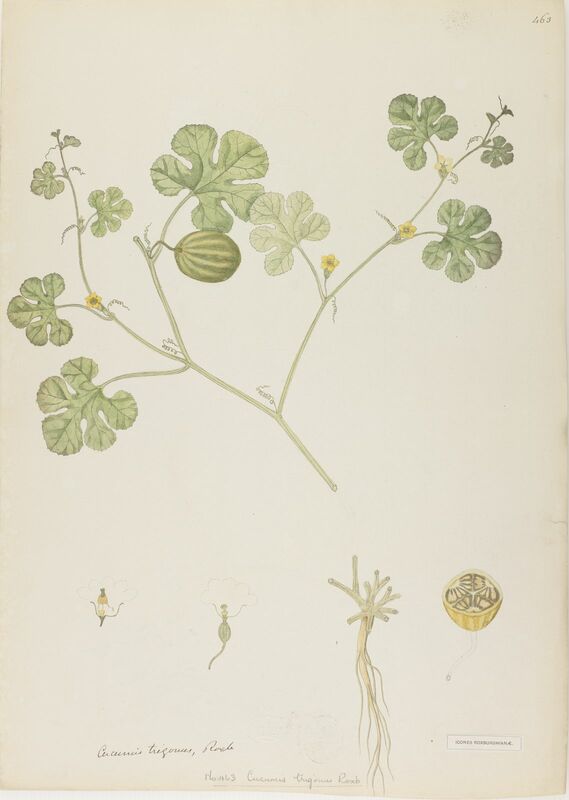 or larger, ellipsoid to cylindrical, ± terete; fruit-stalk stout, 1·5–15 cm. long, expanded upwards. Seeds 10–15 × 6–11 × 2–3 mm., broadly elliptic in outline, rounded at the ends, black, smooth, compressed, with a narrow, thin, wing-like margin. 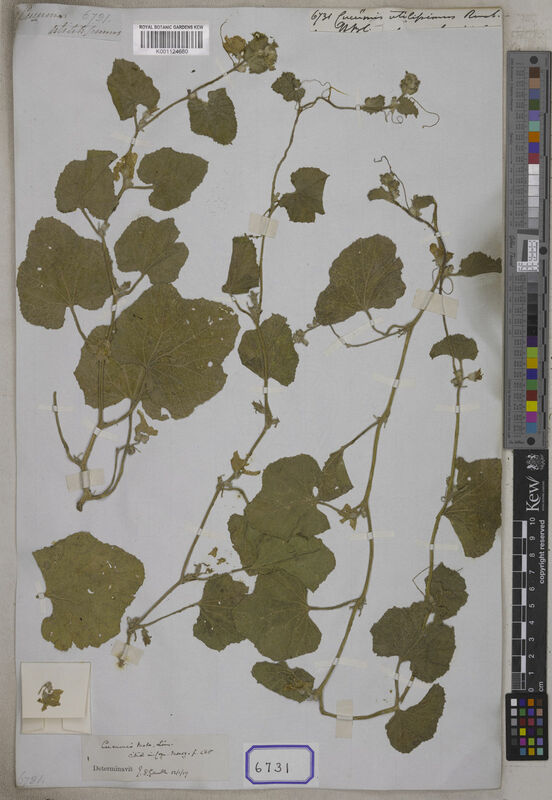 Herbaceous climber or trailer to 15 m.; stems finely hairy. Leaf-blade ovate-cordate in outline, 60–180 mm. long, 60–210 mm. broad, palmately 3–5-lobed; lobes triangular or ovate and broadest at the base, or broadest about the middle, narrowed below and slightly lobulate laterally, acute or subacute and apiculate, entire, sinuate-toothed or strongly sublobulate-dentate; central lobe the most prominent; petiole 22–150 mm. long, finely and somewhat densely adpressed-hairy. 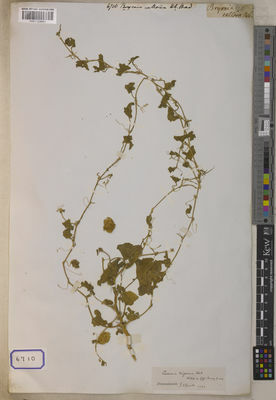 Tendrils 3–6-fid, rarely bifid, branches often unequal in stoutness. Probracts small, Ungulate, glandular, ± 3 mm. long. Male flowers ± 5–16 in 120–350 mm. long racemes; pedicels 3–7 mm. 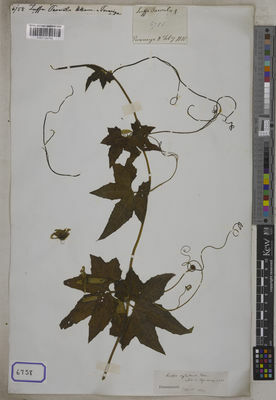 long, each bearing a small glandular bract near the base; receptacle-tube shortly campanulate, 4–8 mm. long, 5–7 mm. across, hairy inside; lobes triangular, acute, often acuminate, 8–12 mm. long; petals yellow or golden yellow, broadly rounded, apiculate, 25–45 mm. long, 18–35 mm. broad; stamens 3 or 5. Female flowers on 15–30 mm. long stalks; ovary cylindrical, densely and shortly adpressed-hairy, obscurely 10-ribbed, 20–36 mm. long, 4–7 mm. across; receptacle-tube shortly cylindrical, 4–6 mm. long; lobes ovate, 10–11 mm. long; petals 30–37 mm. long, 20–30 mm. broad. Male flowers ± 5–16 in 120–350 mm. long racemes; pedicels 3–7 mm. 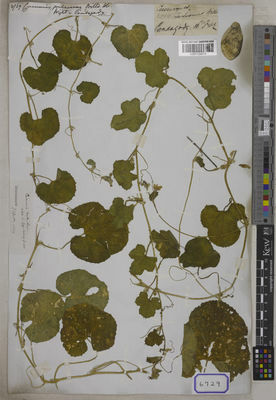 long, each bearing a small glandular bract near the base; receptacle-tube shortly campanulate, 4–8 mm. long, 5–7 mm. across, hairy inside; lobes triangular, acute, often acuminate, 8–12 mm. 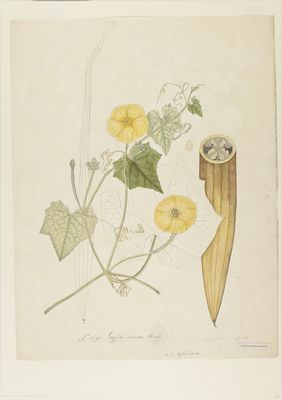 long; petals yellow or golden yellow, broadly rounded, apiculate, 25–45 mm. long, 18–35 mm. broad; stamens 3 or 5. Female flowers on 15–30 mm. long stalks; ovary cylindrical, densely and shortly adpressed-hairy, obscurely 10-ribbed, 20–36 mm. long, 4–7 mm. across; receptacle-tube shortly cylindrical, 4–6 mm. long; lobes ovate, 10–11 mm. 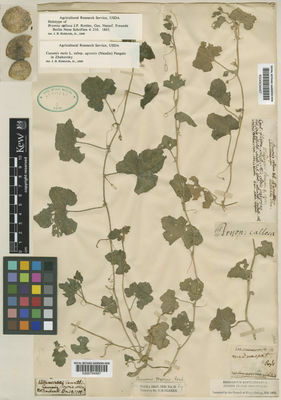 long; petals 30–37 mm. long, 20–30 mm. broad. Fruit on a stout 20–60 mm. long stalk, ellipsoid or cylindrical, 60–190 mm. long, 25–60 mm. across or much larger, glabrous. Seeds lenticular, broadly elliptic in outline, 10–12 × 6–8 × 2–3 mm., ± smooth, dull, blackish, with a narrow membranous wing-like border most prominent distally. 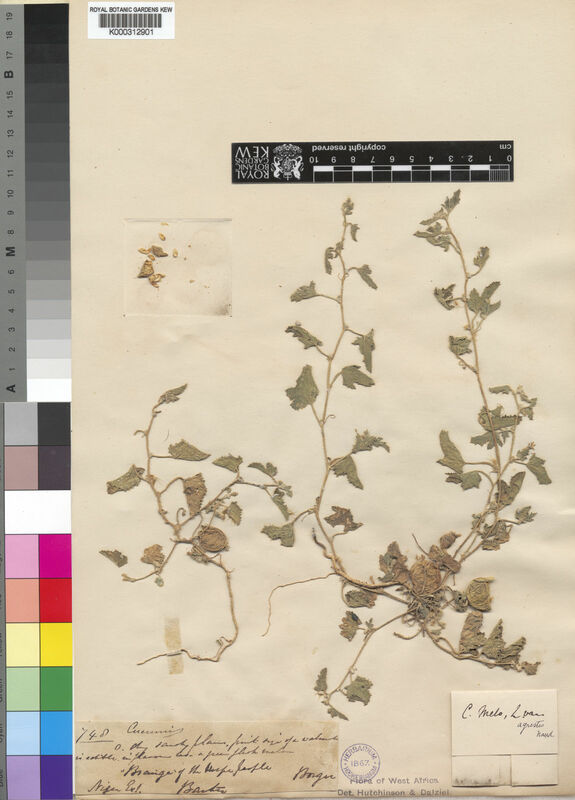 Persisting in old cultivations and near habitations, frequently becoming naturalized in forest, woodland, bushland, thicket and grassland; 0–1530 m.
Cultivada en Colombia; Alt. 10 - 2350 m.; Amazonia, Andes, Llanura del Caribe, Pacífico, Valle del Magdalena. Luffa scabra Schumach. & Thonn. 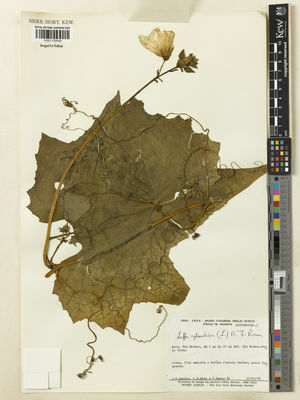 Luffa vittata Zipp. ex Span. Kar, S.K. & al. (2016 publ. 2017). Additions to the flora of Chilika lake and its immediate neighbourhood Journal of Economic and Taxonomic Botany 40: 134-150. Memon, R.A. & al. (2014). Illustrated weed flora of Cotton crop of Khairpur district, Sindh, Pakistan Pakistn Journal of Botany 46: 5-12. Keraudren, Fl. Madag. Cucurbitac: 147 (1966). A. Meeuse in Bothalia 8: 61 (1962). R. & A. Fernandes in Mem. Junta Invest. Ultram., sér. 2, 34: 84 (1962). Chakrav., Monogr. 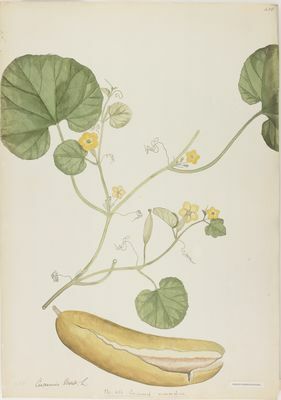 Indian Cucurbitac. : 102 (1959). Grebenščikov in Kulturplf. 1: 121–138 (1953). Pangalo in Bot. Zhur. 35: 571–580 (1950). R. O. Williams, Useful and Ornamental Plants in Zanzibar and Pemba p. 220 (1949). Hassib, Cucurbitac. in Egypt: 78, figs. 30–64. Hook. 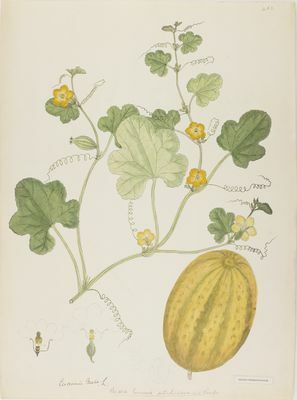 f. in Flora of Tropical Africa 2: 546 (1871). L., Sp. Pl. : 1011 (1753).